albertz benda is pleased to present the gallery’s first solo exhibition with Brie Ruais entitled Ways, on view from May 3 through June 8, 2019. 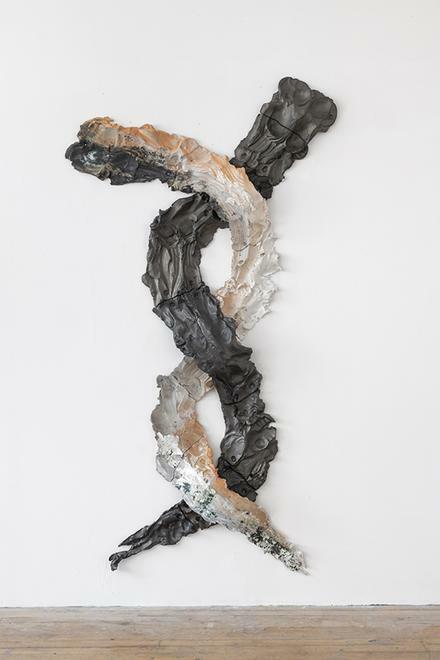 Three ongoing series of works - Topology, From Center, and Interwoven - converge in an installation that maps out, in spatial and material terms, the terrain that the artist’s body navigates and the movements it engenders. Ruais’ process is guided by choreographed actions, full-body gestures, and specified environments. The pieces begin with a mass of clay equal to her bodyweight and are then formed by exhaustive bursts of spreading, pushing, kicking, and scraping. Made in places ranging from the studio, the urban garden, to the illusory, untouched American desert, Ways charts the relationship between the sensorial body, materiality, and the landscape. The latest of Ruais’ ongoing series, the Topology works are most clearly shaped by the setting in which the pieces are made. Ceding control to the space, the artist allows the limitations of her surroundings – in this case the architecture of her garden – to determine the borders of the work. Not only do these pieces bear the marks of the artist’s making, they are impressed with the botanicals growing nearby and the organic matter found on the ground. They function as one-to-one scale maps of the pathways that connect the gardener to her construction of nature. Mapping the Memory of Last Summer's Garden with Five Potted Plants in the Studio (February 2019), conceived as a floor piece for the exhibition, functions as a planter bed that is experienced by walking in a four-foot corridor around the piece, much like walking the paths of a garden. The artist’s gesture is most legible in the From Center works. 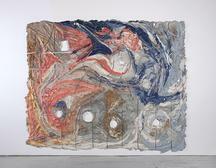 In pieces such as Torn Up From Center, 130 Pounds (Dusk), Ruais moves radially outward from a mass of clay. Her body’s efforts, responding to the resistance posed by the material, are expressed through the imprints of knuckled fists, palm heals, knees, and feet on the work’s surface. 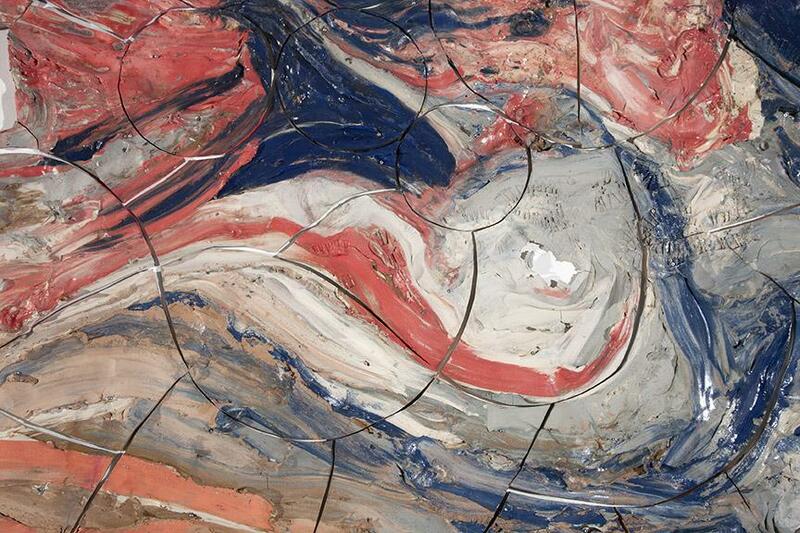 The flow of ridges and ruts are records of the process as it unfolded. Making Space From the Inside, 130 lbs (Secondary Rain Shadow) finds the limits of the artist’s reach on the perimeter of the piece, but continues to expand internally, the ground of clay between the artist’s seat and the perimeter is worn through, resulting in breathlessly frayed edges. In the Interwoven series, the artist complicates the relationship between the interdependent forms of the sculpture. As Ruais explains, these “pieces explore strategies for re-mapping the typically hierarchical social structures held amongst humans, animals, and the earth.” The circuitous figures in All Wound Up (two times 135 lbs) can appear indistinguishably enmeshed but in actuality maintain individuation and work in congruity with one another. In each series of work, Topology, From Center, and Interwoven, Ruais’ sculptures consider how a particular lived body physically, emotionally, and perceptually understands it relationship to its environment. Brie Ruais [b. 1982] lives and works in Brooklyn, New York. She received her MFA from Columbia University's School of the Arts in 2011. Her work has been exhibited at public institutions including the Dallas Museum of Art, Dallas, TX, Katzen Center at American University, Washington, DC, and the Museum of Fine Arts Boston. She has had solo shows with Cooper Cole, Toronto, Canada; Halsey McKay Gallery, East Hampton, NY; Nicole Klagsbrun, New York, NY and Night Gallery, Los Angeles, CA. Awards and residencies include The Pollock Krasner Foundation Grant (2018), The Sharpe Walentas Studio Program (2018), the Dieu Donne Fellowship (2016), Montello Foundation Residency (2017), Socrates Sculpture Park Fellowship (2014), The Shandaken Project Residency (2014) among others. Ruais's work is in the collections of the Dallas Museum of Art, Dallas, TX; the Pizzuti Collection, OH; and the BurgerCollection Hong Kong. She is featured Vitamin C: New Perspectives in Contemporary Art, Clay and Ceramics, by Phaidon (2017).